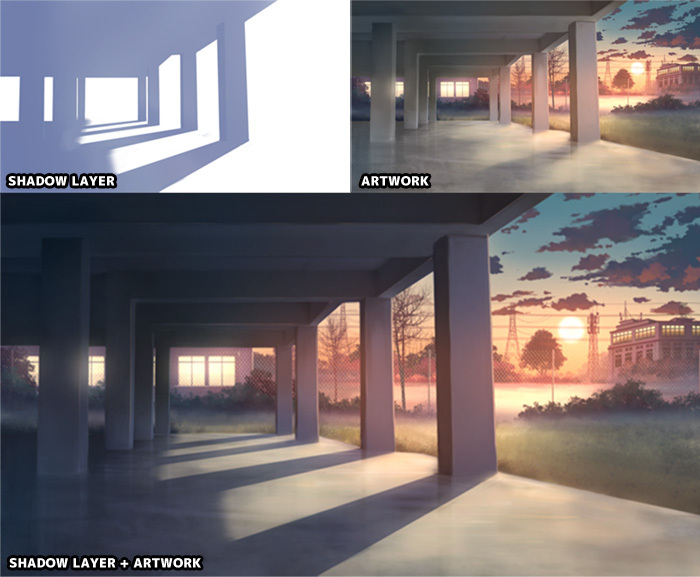 This is a quick tutorial on adding shadow to your anime style background art using Photoshop and some tips to make them look better. Paint the shadow in different layer with a blue or cyan hue color. Distort (CTRL-T) the shadow according to the surface of the artwork. Change shadow layer to "Multiply" blend mode and adjust opacity level if needed. You can experiment with other blend mode such as "Overlay" too. 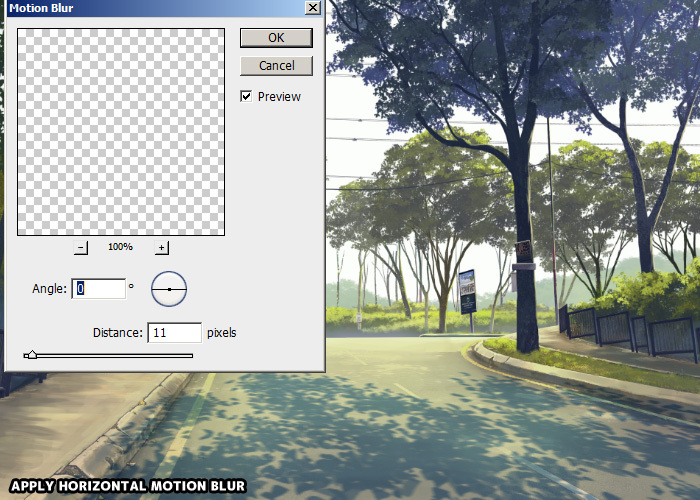 Last, apply a little bit of blur filter on the shadow layer. In my case, I use directional blur (horizontal). Adding shadow to our artwork is straight forward and easy as shown in the steps above. But there are few tips we can always keep in mind. 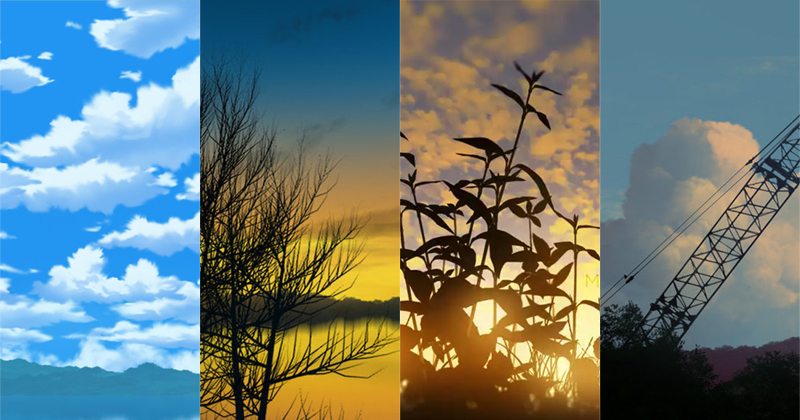 By using layers, we can make adjustments to the shadow easier. Different layers means we can animate them too! Beside from using a single layer, we can also organize the shadow in multiple layers under a folder group. By doing so, we change the group blending mode to multiply instead of changing on the individual layers. Sometime it will be easier to use transform tool (CTRL-T) to adjust the shadow to align on the surface of object that receive shadow. First, duplicate and fill the object which cast shadow with a solid color (The object should be in another layer in the first place). Then, distort it to align with the receiver object surface. Pay attention of the depth or height of the receiver's surface. Sometime, you need to do further adjustment if tiny details like this is bothering you. Also remember that this method is usually not accurate as you can see in the image below. 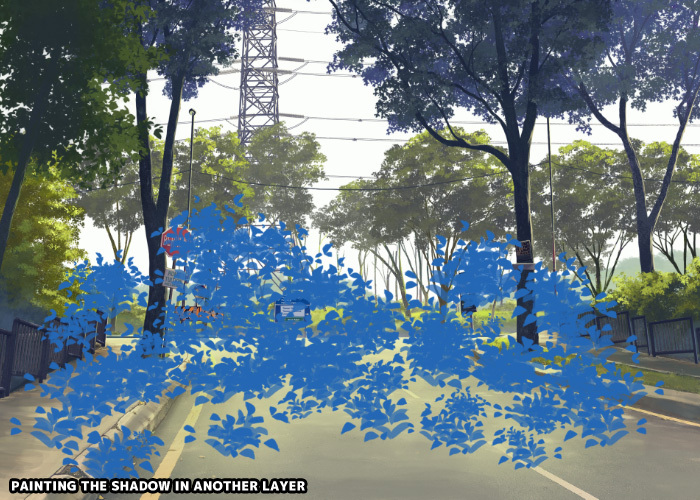 Although this method is not as accurate as we like, but it is still useful to use in case like tree shadows on ground, just like in anime scene! Soft shadow come from a large light source such as sun light casting shadow on tree leaves. Hard edge shadow come from a smaller light source like a candle. Sometime, by just applying a simple blur filter, it will add a lot to the artwork. Instead of just flat blue color, we can use a gradient ramp for the shadow too. From dark blue to light blue, or maybe even shifting its hue value! More Tutorial! More info on What is Shadow Color! More Tutorial! More info on Photoshop grass tutorial! Sometime we can add glowing effect for the receiver object's surface around the shadow edge. 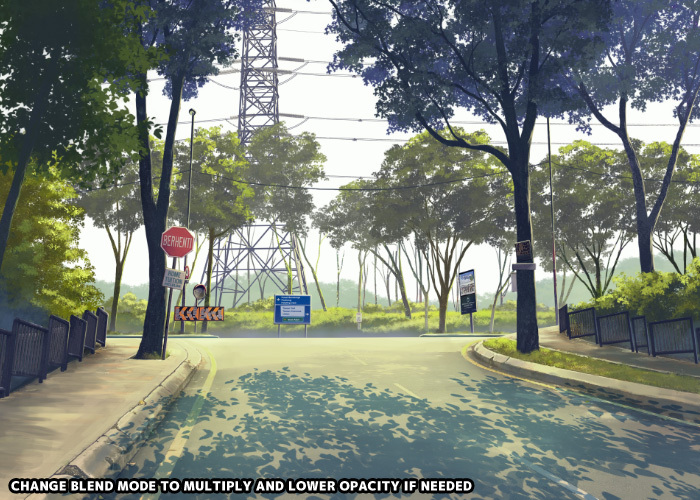 Imagine a hot afternoon with blazing sunlight falling on concrete and road. Add another layer with "Screen" blending mode. Use a soft edge round brush to paint area which is expose to sunlight. That's all and happy painting.